Set free from their collective past and societal rules, the group has the freedom to be who they want to be. In their struggle for survival, they discover that even in a post-apocalyptic world there’s still love, jealousy, and many of the coming-of-age dilemmas they thought they’d left behind with the disappearance of the world they once knew. The Rain is created by Jannik Tai Mosholt (Borgen, Rita, Follow the Money), Esben Toft Jacobsen (The Great Bear, Beyond Beyond) and Christian Potalivo (Dicte, The New Tenants, Long Story Short) and stars Alba August (Reliance, Jordskott and Unga Astrid), Mikkel Boe Følsgaard (A Royal Affair, The Legacy), Lucas Lynggaard Tønnesen (Tidsrejen, Department Q: The Keeper of Lost Causes), Lars Simonsen (The Bridge, Brotherhood), Iben Hjejle (Dicte, High Fidelity), Angela Bundalovic (Dark Horse, Blood Sisters), Sonny Lindberg (The Legacy, Anti), Jessica Dinnage (The Guilty, The Man), Lukas Løkken (One-Two-Three Now!) and Johannes Bah Kuhnke (Force Majeure). 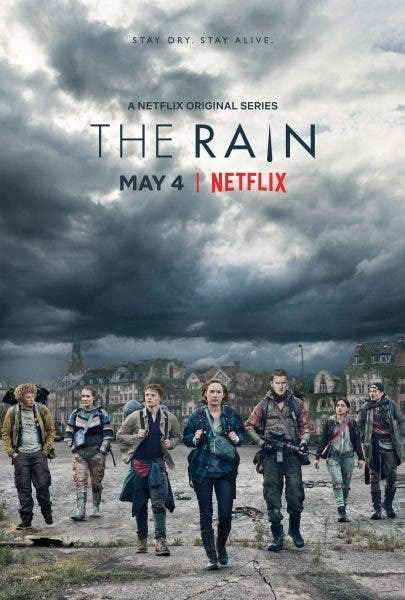 For more details about the show, visit www.netflix.com/therain.